You need to create a new PHP file 🙂 I shared the code in Github repository. https://github.com/dominykasgel/woocommerce-api-import-products see import.php file. What do you want to achieve with the REST API? This is a very good tutorial. I am not a programmer and it is very hard when you want to put your wordpress woocommerce store working but your supplier gives you a lot of code to achieve the Token authorization and to import your products. My problem is I am just starting in this json code and logic and I am just understanding the logic of that. Hi, thank you for the amazing job you did here. Is a fact that there is nothing that can explain how this json files can be used. My supplier gave me all the codes to get the token and after that the products and variations. You say that I have just to create the pho file for the import as you explain and all the products will be upload/update/create woocommerce of my store? It depends on the format of your JSON file. This tutorial shows you how you can parse JSON files and with some PHP import them to WooCommerce. Would you like to send me your JSON file so that I can take a closer look and help you more? The json file I have is like shown here. And also, could you be so kind and tell me how can I say that The Product ID (from my supplier) is the Product SKU (for my woocommerce)? Sorry, can you please give a look to what I sent you earlier? If you need more info please tell me. How do you add/apply images to these newly created posts? I tried adding image urls to the .json file in the place I thought they should be but nothing ever generated through woocommerce. Any help would be greatly appreciated. Thanks for this awesome tut! Are you using the REST API to upload the products and images? If so, you need to define ‘images’ URLs when creating a product. See: http://woocommerce.github.io/woocommerce-rest-api-docs/#product-properties and http://dominykasgel.com/wp-content/uploads/2017/09/REST-API-product-images.png . The API includes images generating too. If you don’t use the API, you can upload the images using https://codex.wordpress.org/Function_Reference/wp_insert_attachment, then adding the images IDs to a product https://gist.github.com/zarankumar/f80a73598152edf7d67a8c91dbf3be25 . Thanks for that info. I actually got that figured out yesterday. It is working great with your code and a few additions to the json file! Thanks again for getting me started in the right direciton. Any idea how to fix this? How can I have the import run multiple times even if a certain attribute exists already (in this case “size”). I could not figure it out in the code. I’m sorry. I’m having this error message too. I believe it doesn’t affect the importation of new content, but I might be wrong. Robert, how did you manage to incorporate image importing into your code? Did you add a new function to the import.php file? I’m happy to hear that. If you want to run the import multiple times, then you need to comment out some code between #29 – #69 lines. The API doesn’t allow you to create the same attributes with the same data, so you need to ignore this part. However, in order to assign a product to a certain attribute, you need to pass $added_attributes as a second argument to get_products_and_variations_from_json( $json, $added_attributes ); functions. Solution: Get already added attributes from WooCommerce – http://woocommerce.github.io/woocommerce-rest-api-docs/#list-all-product-attributes See how it’s already done and create the same $added_attributes variable. If you also need to create new attributes during your next import, then don’t ignore the part below // Import Attributes, but just get all product attributes and see if it’s already there if not, then add it. Sorry, but it requires custom coding. Also, do you know how I would set images for individual variations? Can I just add it to the json file or will I need to add code to handle that as well? Thanks again for your help. Yes, just add the images to JSON file. I wrote a few lines of code with an explanation how you can add/import the images for simple products. See my code here: https://pastebin.com/c8z4ujja For variations, you need to follow the same way – have URLs in products.json file, then add the images to your main product and get the images IDs. You can retrieve the product data and image IDs once it’s imported. 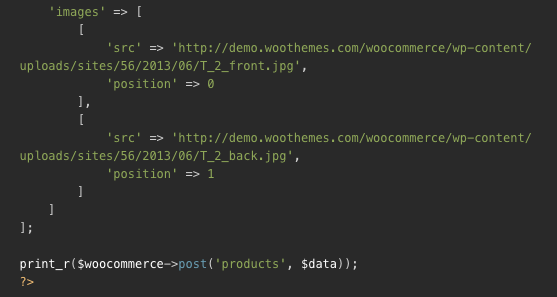 This line: $wc_product = $woocommerce->post( ‘products’, $product ); When you have the images IDs, then you need to assign them to a variation. Example here: http://woocommerce.github.io/woocommerce-rest-api-docs/#product-variation-properties … For every different case you need to modify the import script. I need to change the way woocommerce works so that instead of getting the product price in the standard way it gets the price that I feed to it via an API. Is there a simpler way of achieving that? What I mean is, is it easier to import just the price and integrate it to the existing products or get all the product information from the api? I’m glad to hear it’s useful! 🙂 It’s better to import and update the prices instead of getting the data from the API for every page load. You may have too many calls and it may slow down your website. Thanks! I don’t think there would be that many products. How would one go about refreshing just the prices for every page load? If you just want to show the price, but don’t use it for the checkout, then I don’t see a problem. Otherwise, I would setup a cron job and run a script to update the prices in the database. You can have only one call to the API just to update the prices in the DB and run it daily. Last question for now I swear! Here’s an even trickier one. How do we add multiple variation types and conjoin them? I know it’s easy to accomplish manually when adding a product but I haven’t quite figured out how to make it work with this code. For example I’d like to have this import generate variations based off of two separate types of attributes, in this case Size and Gender. However, when adding this “attributes” to my json file it does not work. If you could help me solve this last problem you would be an absolute life saver!! No problem. You need to modify the import script so that you can include more attributes and values. See my explanation here: https://pastebin.com/Tp062xFZ Sorry, but I can only show you how you can do it. After quite a few hours, I think I got most of it right. I had a major setback due to the script not recognizing the url from the API as a file. So, I had to tweak with the first section of the code. I change the ‘file_exists()’ for a funtion to verify if the URL is valid. Don’t know what happened there. Can you edit the comment and add a link to the code snippet instead? All else seems to be in place, I got it to add images to the products and product variables as well, thanks! I’m trying to create a script that updates the prices of my products and their variations via a cron job. I suppose I’d need this API? I’ll have to call the Rest API and update it with the prices of my external API (since they vary wildly during the day I don’t think I’d need to compare them before updating). But, I’m at a loss on how to isolate the price variable and have it updated. Awesome! I guess I was overcomplicating this stuff. I was all tangled up on new API POST authentications and what not. This code seems to be working properly. The way it works now, I have to set the prices manually in the script. How would you do to have the script look for the prices on the external API instead? Answering your question, it depends on the data you need. In order to change the price, you need to know the product ID. Can you get it from your external API? If not, then you need some kind of parameter to sync the price from your external API to the right product in your store. It could be SKU or product title. When you have the product id you can change the price. As you can see, it’s a nightmare if you need to update anything, as each update call is linked to a specific product ID. Should I put the code in Woocommerce template file? I’m glad to hear that you find the article useful. This means a PHP wrapper for the WooCommerce REST API is missing. There are wrappers for Ruby and Python as well. In order to use the API in PHP, you need to install the wrapper. Take a look at installation: https://github.com/woocommerce/wc-api-php#installation The best way is to use composer (https://getcomposer.org/doc/00-intro.md#installation-linux-unix-osx) and install it in the same directory as the import.php file. Thanks for responding. Yes, I figured that later after posting here :). Seems to be fine now. Thanks again. Thanks for amazing tutorial . My question is bit off topic but I guess you would be able to help me . I am trying to import products from Woocommerce site via API and importing it to my php site. Now this returns 10 Products . How do i setup auto pagination or somehow make the script load all the products ?? I’m trying to connect the categories to the products, but I don’t get why it isn’t working. I created the categories before the products and then give the ID to connect the product to a category, but still doesn’t work. Can you add your code to pastebin and copy the link here? The problem is that I can actually create the categories, but the ID doesn’t get matched with the product. Thank you for that fantastic post . I have a financial software for managing products now i have built an website based on woocommerce. I want my online store to get products automatically from my software . And I want to add product variations on my product page. Can you help by generating the code. Hi Dominykas, congratulations on the excellent work. I am trying to put in my system but I do not understand the authentication part, I only have one Token and the authentication mode is the basics, can you guide me? Glad to see you are still working on this. I have a few questions: is since I am not uploading a product.json file I am retrieving it from a remote API. How do I get that file? I know your code gets the file from the local directory but I am trying to connect to an outside API. other question is can I put this into my functions.php or should i call this php script else where? thank you! Great post! But unfortunately I’m having a problem: I’m running the supplied code without any change, the json that I’m using is also the one provided in the example, I just modified the WooCommerce API credentials, just to test the connection and operation of the API token. When executing the code it imports the attribute normally, but at the time of importing the products it only imports the first one and issues an error: “Syntax error”. this error is still issued to the first product, even though it is being imported successfully. I can not find what’s wrong. is even more difficult to understand since I am using the example without any change. I’ll be grateful if anyone can help me with this. Hi Luis, try to change the WC API version to ‘wc/v2’ in $woocommerce = new Client(…). Looks like I made a typo.. I just tested the script with ‘wc/v2’ and it works really well. You’ll get a syntax error if you run it with ‘wc/v1’. Thanks for listening! The WC API version was already in ‘wc / v2’. But luckily I discovered the problem. The version of PHP that was running on my server was 5.2.17 and it was nessesssario to upgrade to some 5.3 or higher. In case I’m using it now to 5.6 and everything is working right. Hello, Dominykas. Thanks for sharing. I have a problem in line 43 of file import.php: PHP Fatal error: Cannot use object of type stdClass as array. Based on your code, I’m trying to write an script to update the existing products and its variations (>1,300 products with multiple variations). I read that is not possible to update one product and its variations at same time, so in first place I use batch update for the products and, after, I do a batch update for the variations of one product every time. This means a lot of time that exceeds the limits allowed by my server. Do you know any alternative way for make this import faster? How to update existing product on woocommerce using json product parent id can you help me to solve this? How can I send product information from Woocommerce store to my own marketplace(which is in asp.net)?? Instead of JSON, is it possible to also import products using CSV. I have seen a tutorial for creating a custom dashboard with products using WooCommerce rest api (https://www.cloudways.com/blog/custom-dashboard-using-woocommerce-php-rest-api/ ). I was wondering if you could also add product import functionality to it. Yes, it’s possible. You just need to parse CSV instead of JSON. I am working with woocommerce, i am interested to import products from Bangood by Api to Woocommerce, is that possible with this technique? i have basic knowledge of php. I haven’t used Bangood API so I don’t know. Thank you for the code, I inserted the products very simply using the script. My question is how to use the script to update the already imported products, insert new and update the inventory of products. Thank you in advance for your reply. Happy to hear that! You can find this in the documentation 🙂 Take a look here: https://woocommerce.github.io/woocommerce-rest-api-docs/?php#update-a-product. “Update a product – This API lets you make changes to a product.” HTTP Request: PUT “/wp-json/wc/v2/products/” code: $data = [ ‘regular_price’ => ‘24.54’ ]; print_r($woocommerce->put(‘products/794’, $data)); Change regular_price to stock_quantity or whatever you want to change. Thank you for the quick response and the suggestions. I’ll try to make changes to the code. Please for another help. I want to take the json code from a url address. I saw that there is a code for it in the comments, but I do not manage to figure out how to write the url for my site. Now I work locally and the api address that gives the json code is http://trinity-slim/ api /products. How should I write the url address so I can download the json code from a url instead of a file. Thank you for your help. I want to use your code, I have api keys from my woocommerce site but I have no idea where I need to put the import.php page. Please help me. Thank you. Please help me put in your code. Thank you. I launched your script and managed to import products in my woo site. In my woocommerce site I only have simple products. The script imports the products but gives me an error “Notice: Undefined variable: added_attributes in C: \ xampp \ htdocs \ woo-api-import-products \ import.php on line 71”. Please, can I somehow escape this error? I created the categories before the products and then give the ID to connect the product to a category, but still does not work. It does not report a code error, but the categories are not entered. Can I send you a code here? Thank you for your help. Yes, upload your JSON file and import PHP script to Pastebin or somewhere else and copy here. If you have only simple products, then you don’t need to import the attributes. Looks like you haven’t removed that part from the script. Remove it. Can’t help without seeing the code.. In the products.json file, I tried to import IDs for categories, but I received an error message. Many times I saw the documentation of the woocomerce but I can not figure out how to use the code. Please help me, I am new to php language. can you tell me? which autoload.php file i have to connect? I have installed composer and also i used composer require automattic/woocommerce this command to install woocommerce. is it right? and one more thing I want to know. can I import data from an external JSON API? using this technique. let me explain you very clearly. if I use this technique to get data from an external API. Will it add here? http://prntscr.com/jilf98 and it will be looped on the website shop page? But I still can not add categories. Please for help. Thanks for sharing your work! It’s great! I’m struggling with Woocommerce API because. My problem is: I need to update “external_url”, “regular_price” and “sale_price” in almost 7100 “external products” using a JSON that comes from a big website, 4 times a day. I’m not a developer, but I could build a code to put it running, but just for few products, when I try with more (1000 as example) it’s not working because I’m getting “504 Gateway Time-out” always. Do you already use API for so many records? Do you know how can I handle it? I have a woocommerce store at https://bigthicketcoin.com/shop and I want to pull in products from another source who has provided me a test site and live key. How would you recommend I GET that into my wordpress site. I am slightly new to REST API/JSON but I know my basics.. The other source is a website with a store management system. I forgot to add that. They have provided a testlink and live public/private key. Hey, this codes are for importing to woocommerce backend right? What about if I want to generate json for all woocommerce product archive based on specific tag? Im trying to create a woocommerce tag widget AJAX but I’m stuck at importing the listed product based on tag. Thanks for great sharing! It’s really help alot! Can you please help me in solving this. It’s the first time i’m going to use REST API and i’m a beginner. I would like to ask a question. I have a store and a vendor who provides his products feeds through a rest.php file. This case can work for my case too or i need to create something else? i’m educating myself doing post get requests with woocommerce rest api doing well, using postman for request pasting json data to body of request. Or which way should I move to create variations for newly created product how can I know it’s newly created id to parent it?